Sunlight, exposed skin, and time are needed for a sunburn. Sunlight consists of infrared, visible and ultraviolet light. Ultraviolet light, which consists of UVA, UVB and UVC rays, causes skin to burn. UVA rays cause tanning and wrinkling, while UVB rays cause sunburn, aging, wrinkling, and skin cancer. UVC rays do not cause any health effects because they do not reach the earth’s surface (1). Despite these hazards, sun exposure has benefits. UV radiation helps make vitamin D, a key factor for calcium absorption. However, travelers should be aware of the risks of overexposure to harmful UV rays. Exposure to sunlight is influenced by geography, climate, and time of day and year. Countries near the equator and areas at higher elevation receive more UV rays. Sunlight exposure is highest during the summer and between 10:00 a.m. and 4:00 p.m. Outdoor activities, whether snow skiing or spending the day at the beach, increase the chances of getting sunburned. Snow and light-colored sand reflect UV light and increase sunburn risk. In these situations, UV rays may reach exposed skin from both above and below. Even on cloudy days, UV radiation reaches the earth. Many drugs increase sensitivity to sunlight and the risk of getting sunburn. Some common ones include thiazides, diuretics, tetracycline, doxycycline, sulfa antibiotics, and nonsteroidal anti-inflammatory drugs, such as ibuprofen. Unlike a thermal burn, sunburn is not immediately apparent. Symptoms usually start about 4 hours after sun exposure, worsen in 24-36 hours, and resolve in 3-5 days. In mild sunburn, the skin becomes red, warm, and tender. More serious burns are painful, and the skin becomes swollen and may blister. When a large area is burned, headache, fever, nausea, and fatigue may develop. The pain from sunburn is worse 6-48 hours after sun exposure. Skin peeling usually begins 3-8 days after exposure. Severe sunburns can be serious in babies, small children, and older adults. Years of overexposure to the sun lead to premature wrinkling, aging of the skin, age spots, and increase in the risk of skin cancer. In addition to the skin, eyes can get burned from sun exposure. Sunburned eyes become red, dry, and painful, and feel gritty. Chronic exposure to sunlight may cause pterygium (tissue growth that leads to blindness), cataracts, and perhaps macular degeneration, a leading cause of blindness. Several steps can be taken to reduce the risk for sunburn. Dermatologists recommend using a full-spectrum sunscreen that absorbs UV rays or a sun block that deflects all UV rays (2). Sunscreens are available in creams, gels, lotions, and wax sticks. While the type of sunscreen is a matter of personal choice, travelers may want to choose a water-resistant product that will not be easily removed by sweating or swimming. There are no waterproof sunscreens. Sunscreens should be used regularly, even on cloudy days, because most of the UV rays pass through the clouds. Sunscreens can be applied under makeup. Although some cosmetic products contain sunscreens, their sun protection factor (SPF) is usually not high enough to be very protective. While sunscreens absorb UV radiation, chemical sun blocks scatter, reflect, and physically block UV radiation. The most well-known chemical sun block is zinc oxide. Other commonly used sun blocks are talc or titanium dioxide. Effective sunscreens should have an SPF of at least 15. SPF refers to the amount of time that persons will be protected from a burn. An SPF of 15 will allow a person to stay out in the sun 15 times longer than they normally would be able to stay without burning. The SPF rating applies to skin reddening and protection against UVB exposure. SPF does not refer to protection against UVA, which causes the skin to age. Products containing Mexoryl, Parsol 1789, titanium dioxide, zinc oxide, or avobenzone block UVA rays. While the SPF represents the UVB protection under the best conditions, sunscreen performance is affected by wind, humidity, perspiration, and proper application. Sunscreens also lose their potency in 1-2 years. Sunscreens should be liberally applied (at least 1 ounce) ≥20 minutes before sun exposure. Special attention should be given to covering the ears, scalp, lips, neck, tops of feet, and backs of hands. Sunscreens should be reapplied at least every 2 hours and each time a person gets out of the water or perspires heavily. Some sunscreens may also lose efficacy when applied with insect repellents, necessitating more frequent application when the two products are used together. Another effective way to prevent sunburn is by wearing appropriate clothing. Dark clothing with a tight weave is more protective than light-colored, loosely woven clothing. High-SPF clothing has been developed to provide more protection for those with photosensitive skin or a history of skin cancer (3). This type of clothing contains colorless compounds, fluorescent brighteners, or specially treated resins that absorb UV and often provides an SPF of 30 or higher. Travelers should also wear wide-brimmed hats and sunglasses with almost 100% UV protection and with side panels to prevent excessive sun exposure to the eyes. The UV index, which indicates how much ultraviolet light exposure will occur, can be found in the weather section of most large daily newspapers, in some television weather forecasts, and on the Internet. The UV index ranges from 1 (low) to 11 or higher (extremely high). Travelers are advised to take extra precautions to prevent sunburn when the UV index is high. There is no quick cure for minor sunburn. Symptomatic treatment can be initiated with aspirin, acetaminophen, or ibuprofen to relieve pain and headache and reduce fever. (Children and teenagers should generally not be given aspirin because of the danger of Reye syndrome.) Drinking plenty of water helps to replace fluid losses. Cool baths or the gentle application of cool wet cloths on the burned area may also provide some comfort. Travelers with sunburns should avoid further exposure until the burn has resolved. Additional symptomatic relief can be achieved through the application of a topical moisturizing cream, aloe, or 1% hydrocortisone cream. A low-dose (0.5%-1%) hydrocortisone cream, which is sold over the counter, can be helpful in reducing the burning sensation and swelling and speeding up healing (4). If blistering occurs, lightly bandage or cover the area with gauze to prevent infection. The blisters should not be broken, as this will slow the healing process and increase the risk of infection. When the blisters break and the skin peels, dried fragments may be removed and an antiseptic ointment or hydrocortisone cream may be applied. Indications for medical attention include severe sunburns covering more than 15% of the body, dehydration, high fever (>101(F), or extreme pain that persists for longer than 48 hours. Clark J. Shining light on UVA importance. Dermatology Times [serial on the Internet]. 2003 Mar 1 [cited 2006 June 13]. Available from: http://www.dermatologytimes.com/dermatologytimes/article/ articleDetail.jsp?id=50923 . Glanz K, Saraiya M, Wechsler H. Guidelines for school programs to prevent skin cancer. MMWR Morbid Mortal Wkly Rep. 2002;51:1-18. Murphy ME, Montemarano AD, Debboun M, Gupta R. The effect of sunscreen on the efficacy of insect repellent: a clinical trial. J Am Acad Dermatol. 2000;43(2 Pt 1):219-22. Duteil L, Queille-Roussel C, Lorenz B, Thieroff-Ekerdt R, Ortonne JP. A randomized, controlled study of the safety and efficacy of topical corticosteroid treatments of sunburn in healthy volunteers. Clin Exp Dermatol. 2002;27:314-8. Heat stress is a buildup of body heat generated either internally by muscle use or externally by the environment. 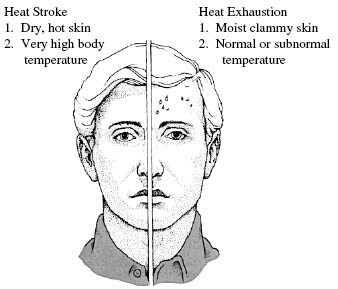 Heat exhaustion and heat stroke result when the body is overwhelmed by heat . As the heat increases, body temperature and the heart rate rise painlessly. An increase in body temperature of two degrees Fahrenheit can affect mental functioning. A five degree Fahrenheit increase can result in serious illness or death. During hot weather, heat illness may be an underlying cause of other types of injuries, such as heart attacks, falls and equipment accidents. More Worker's Compensation claims for heat illness come from agricultural workers than from any other occupation. The most serious heat related illness is heat stroke. The symptoms are confusion, irrational behavior, convulsions, coma, and death. While over 20% of heat stroke victims die regardless of health or age, children seem to be more susceptible to heat strain than adults. In some cases, the side effects of heat stroke are heat sensitivity and varying degrees of brain and kidney damage. Protect Health - Heat illness is preventable and treatable before it is life threatening. Improve Safety - Any heat stress can impair functioning. Increase Productivity - People work slower and less efficiently when they are suffering from heat stress. Employers, supervisors and workers all have an essential role to play in preventing heat stress. Each member of the team should use good judgment to prevent heat related illness. A heat stress control program should protect all workers at the operation, from those who can work comfortably in heat to those in poor physical shape. Drink one glass of water every 15 to 30 minutes worked, depending on the heat and humidity. This is the best way to replace lost body fluid. Read medication labels to know how cause the body to react to the sun and heat. Avoid alcohol and drugs as they can increase the effects of heat. Build up tolerance for working in the heat. Heat tolerance is normally built up over a one to two week time period. Take breaks to cool down. A 10 - 15 minute break every two hours is effective. Adapt work and pace to the weather. Provide heat stress training to workers and supervisors. Manage work activities and match them to employees' physical condition. Use special protective gear, such as cooling garments and cooling vests on "early entry" workers. Know heat stress first aid techniques. Move the victim to a cool place. Remove heavy clothing; light clothing can be left in place. Immediately cool the victim by any available means. Such as placing ice packs at areas with abundant blood supply (neck, armpits, and groin). Wet towels or sheets are also effective. The cloths should be kept wet with cool water. To prevent hypothermia continue cooling the victim until their temperature drops to 102 degrees Fahrenheit. Keep the victim's head and shoulders slightly elevated. Seek medical attention immediately. All heat stroke victims need hospitalization. Care for seizures if they occur. Do not use aspirin or acetaminophen. Keep the victim lying down with legs straight and elevated 8-12 inches. Cool the victim by applying cold packs or wet towels or cloths. Fan the victim. Give the victim cold water if he or she is fully conscious. If no improvement is noted within 30 minutes, seek medical attention. When possible, schedule heavy tasks and work requiring protective gear for cooler, morning or evening hours. Prolonged, extreme hot temperatures mandate the postponement of nonessential tasks. Most protective garments limit sweat evaporation (but not sweat production) and chemical-resistant suits can cause rapid dehydration if sweat is not replaced. One way to slow the buildup of heat when wearing PPE is to use special cooling garments. If the temperature is above 70 degrees Fahrenheit: Cooling vests may be useful when pesticide handlers are wearing chemical-resistant suits and are either doing heavy or moderate work for a prolonged period. If the temperature is above 80 degrees Fahrenheit: Working in chemical-resistant suits for more than a half hour without taking frequent water and rest breaks is unsafe. Cooling garments and frequent breaks are recommended. Powered air-purifying respirators and supplied-air respirators generally feel cooler than other types of respirators because breathing resistance is minimized and the airstream has a cooling effect. Heat stress is serious and should be handled as such. As strain from heat increases, body temperature and heart rate can rise rapidly. Exposure to heat can be serious to children and adults. Have plenty of liquids available and administer first aid as needed. 1. The illness caused by heat stress is very real. 2. Heat stress may result from the buildup of muscle generated heat in the body. 3. Exposure to heat stress is not a problem with children. 4. The most serious heat related illness is heat stroke. 5. Over 20% of those who suffer a heat stroke die.